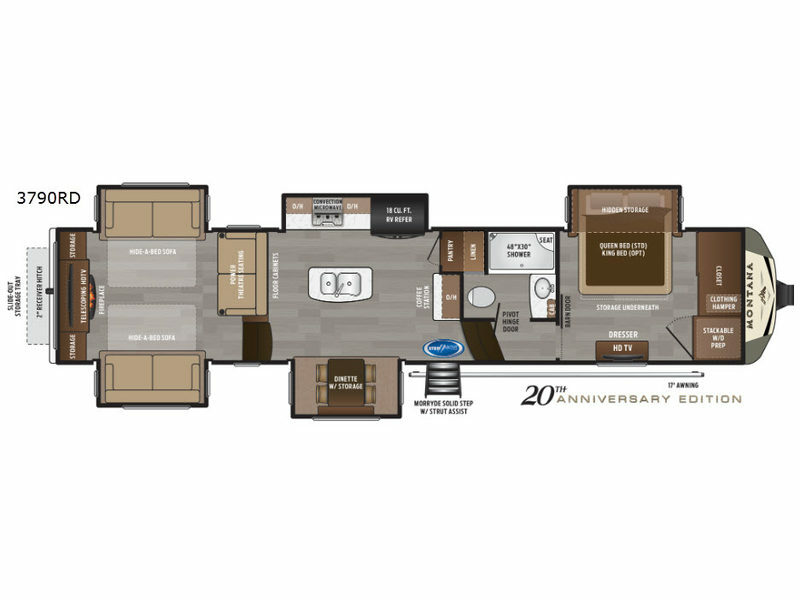 If you want your own space to cook, your own space to watch TV, and your own private bedroom, take a look at this Montana fifth wheel. This layout offers a rear living and entertaining room with plenty of seating including dual hide-a-bed sofas and theatre seats with power recliners. Imagine everyone gathered around the HDTV and fireplace to talk about their day, watch a movie, or relax for a while in the warm indoors. The kitchen offers a separate space to make and eat meals. You will find a center island, an 18 cu. ft. RV refrigerator, a convection microwave, and a pantry, plus more. There is inside storage throughout for your clothes, camping gear, and kitchen cookware. And outside there is exterior compartments including a slide out storage tray. When packing for your next trip in a Keystone Montana luxury fifth wheel you will appreciate the enormous drop frame pass-through storage compartment, the MORyde "Step Above" entry steps with strut assist, and the LED light package including "super-bright" taillights with backup marker and off-door scare light. The Montana 20th Anniversary Edition adds exclusive features such as the Key TV satellite prep, color-coded wiring, Tru-fit slide construction, and a Dometic power channel awning with free accessory. You will love the new designed front fiberglass cap with upgraded graphics, the LED motion sensor light in the pass-through compartment and convenience center, plus the Four Season Living package allowing you to travel whenever you like. It's time to find the luxury fifth wheel you can enjoy for years to come, choose a Montana by Keystone today!